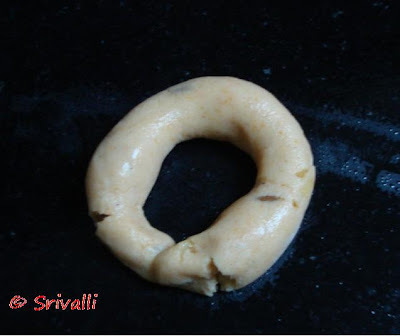 Spice your Life: Chegodilu / Chekodi November Challenge for Indian Cooking Challenge ~ Step by Step! Planning this month's challenge for Indian Cooking Challenge had in me a toss! I knew it had to be a savory. I planned for south Indian mixture, but since it was already made, it was dropped. Running pillar to post, finally hit on Chegodi or Chegodilu as it is called in Andhra. This is one of the most favorite snack items sold in shops and of course made at home. The other thing I wanted to make were the Karasev, but Amma cautioned that it is kind of risky attempting them as there are possibilities of missiles shooting out, if one is not careful. So heading the warning, I decided against it. I simply love Karasev, so planning to take it sometime for ICC. 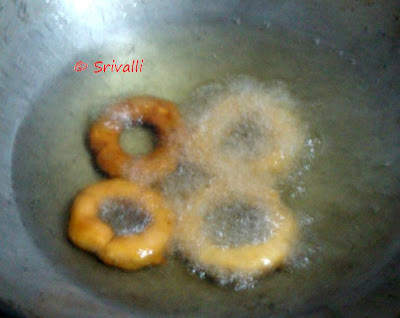 Meanwhile let's enjoy making these Ring Muruku as these are called in the shops in Tamil Nadu, for this month. I went specially to shop to check out the Tamil name. I have always known this as only Chekodi. Chekodis I remember my relatives getting us every time they visit us. We have never bought it ourselves from our area. So my memories are so intertwine with guests visiting us. Amma gave me two recipes, selecting two ways of making a dish always gives us much challenge. As usual with all challenges I attempt it at the last moment. First time I made, I thought I would just try it as I think it can be easy and ended up with a chekodi that was crisp to begin with and ended up being little soft. I was discussing on this with Lataji and Nimi on the flour texture. Lataji used both shop bought rice flour and home made flour. Nimi tried with shop bought and thought it was breaking. I explained to her that this is primarily to do with the dampness that has to be there in the flour. So again for this one has to grind the flour at home for best results. Else should increase the moisture content. You can follow this method for making rice flour at home. Most might feel it is laborious, but when you are making small quantity, it is really not. 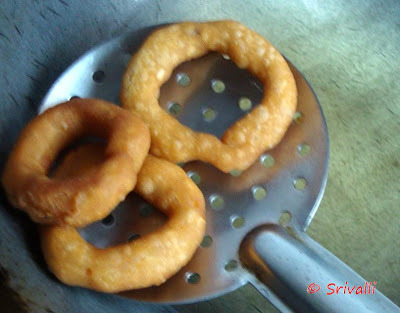 Enjoy these crunchy chekodi with a cup of tea or coffee! When the water starts boiling, remove from stove, add ajwain, red chilli powder, turmeric and flours. Stir with a ladle to make sure it is mixed well. Pour ghee on it and cover. Once it cools, knead it to form smooth dough.